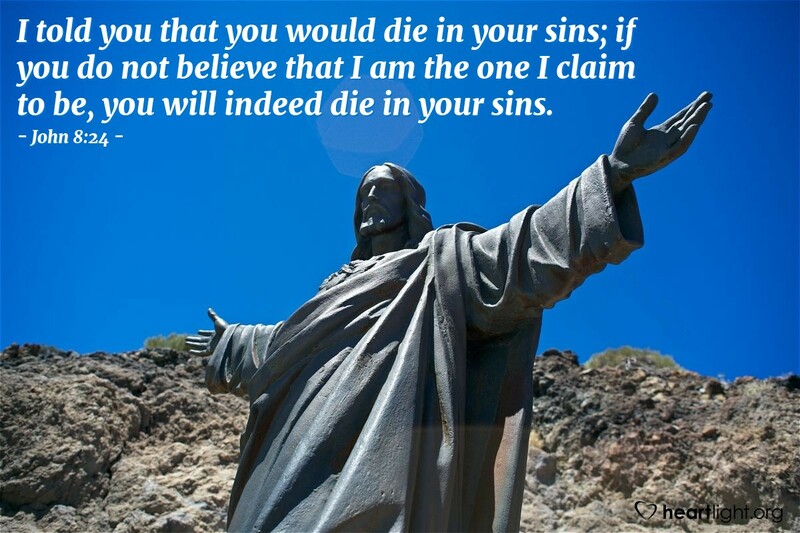 The crucial phrase, somewhat disguised by our translations, is this one: "Unless you believe that I AM, then you will die in your sins." As John so often does, he grabs a simple phrase, fills it full to the brim with meaning, and leads us to see Jesus in a dramatically fresh way. Jesus is I AM, God with us. How could God love us so? We can't know the full answer to this, but we can surely believe and rejoice and live for his glory. Holy and Righteous God, thank you for Jesus and all that he is and all that he has done for me. To your glory and in Jesus' name, I praise and thank you for the confidence that I can have in your promise that I will not die in my sins. Even more, dear Father, thank you for the assurance that when I die, I will live with you. Amen.